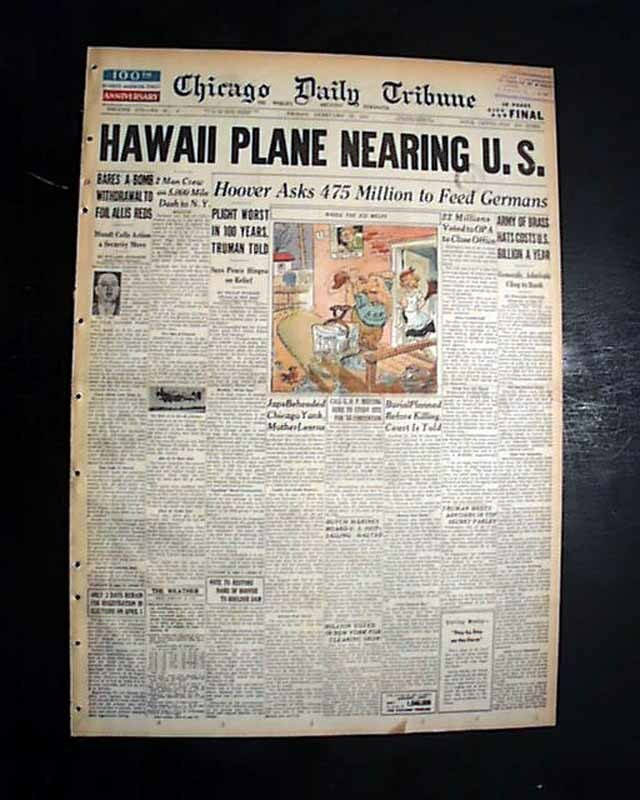 The front page has a nice banner headline: "HAWAII PLANE NEARING U. S." with subhead and small photo. (see) Nice for display. See below for description of this aviation event. Complete with all 38 pages, light toning at the margins, small library stamp within the masthead, small binding holes along the spine, generally nice. 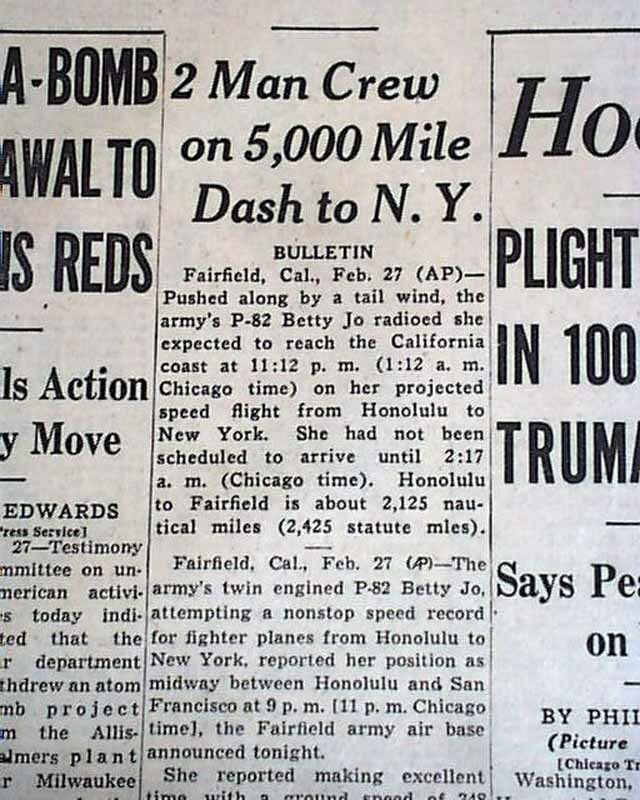 wikipedia notes: On 27 February 1947, a P-82B 44-65168 named Betty Jo and flown by Colonel Robert E. Thacker made history when it flew nonstop from Hawaii to New York without refueling, a distance of 5,051 mi (8,129 km) in 14 hr 32 min (347.5 mph/559.2 km/h). This flight tested the P-82's range. The aircraft carried a full internal fuel tank of 576 gal (2,180 l), augmented by four 310 gal (1,173 l) tanks for a total of 1,816 gal (6,874 l). Also, Colonel Thacker forgot to drop three of his external tanks when their fuel was expended, landing with them in New York. 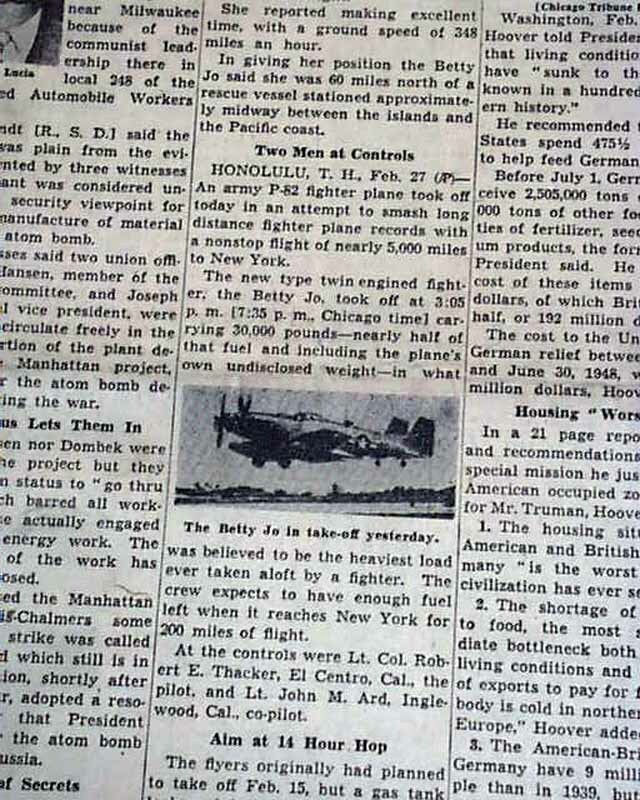 To this day, it remains the longest nonstop flight ever made by a propeller-driven fighter, and the fastest such a distance has ever been covered in a piston-engined aircraft (the record for the longest unrefueled flight by a propeller-driven aircraft of any type is held by the Rutan Voyager). The aircraft chosen was an earlier "B" model powered by Rolls-Royce Merlin engines.